In 2009, Barack Obama's inauguration was a civil rights turning point. 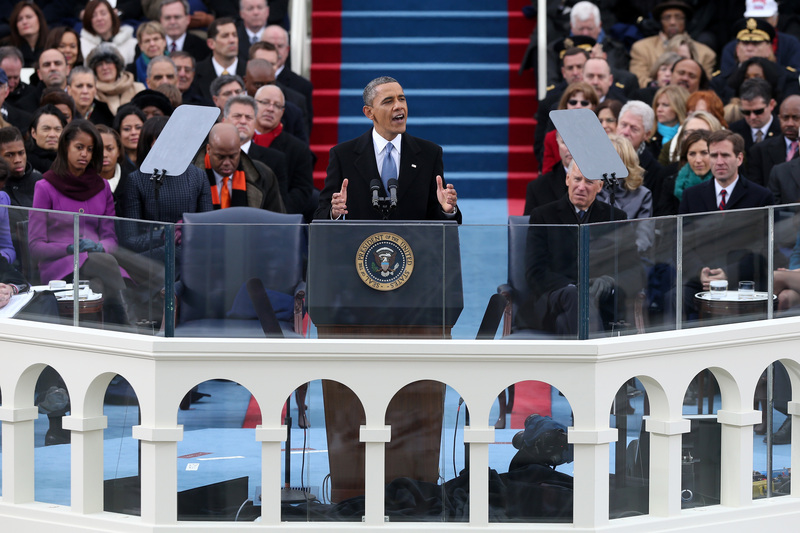 In his 2013 inaugural address, he sang the song of America's civil rights progress. He talked about how the growing support for the rights of women, African-Americans, and gays affirmed the essential promise in the Declaration of Independence. At a time when Washington seems so tiny you could fit it into your pocket, he asked everyone to look up from their Twitter feed to see how much had changed around them. The president was nodding to the coalition that elected him and that he represented, sewing it more fully into the American story. (He's not the only sign of change. The new Congress has 20 women senators, a record.) In his first inaugural address, the president cited familiar turning points in American history: "Concord, Gettysburg, Normandy and Khe Sahn." This time, the historical heroes were straight from his electoral coalition. He named the crucible moments in women's rights, gay rights, and African-American rights: "We, the people, declare today that the most evident of truths--that all of us are created equal--is the star that guides us still; just as it guided our forebears through Seneca Falls, and Selma, and Stonewall; just as it guided all those men and women, sung and unsung, who left footprints along this great Mall, to hear a preacher say that we cannot walk alone; to hear a King proclaim that our individual freedom is inextricably bound to the freedom of every soul on Earth." It is now our generation's task to carry on what those pioneers began. For our journey is not complete until our wives, our mothers and daughters can earn a living equal to their efforts. Our journey is not complete until our gay brothers and sisters are treated like anyone else under the law for if we are truly created equal, then surely the love we commit to one another must be equal as well. Our journey is not complete until no citizen is forced to wait for hours to exercise the right to vote. Our journey is not complete until we find a better way to welcome the striving, hopeful immigrants who still see America as a land of opportunity until bright young students and engineers are enlisted in our workforce rather than expelled from our country. Our journey is not complete until all our children, from the streets of Detroit to the hills of Appalachia to the quiet lanes of Newtown, know that they are cared for and cherished and always safe from harm. Before the speech, an Obama adviser said to me, "He won't say, "I won, but ...,"his voice trailing off. In other words, the president would all but say that. If you were listening during the campaign, the themes in the president's second inaugural address sounded familiar. What Republicans heard was a tone poem from the president to growing government. If a Republican president had been speaking, there would have been paragraph after paragraph about tackling the deficit, the sapping evil of the federal government, and the danger the country's mounting debt poses to personal liberty. Obama barely mentioned the deficit. When he did, it was to warn against excessive spending reductions. The president passed by the deficit on his way to making a larger point about government spending. Obama said, "We reject the belief that America must choose between caring for the generation that built this country and investing in the generation that will build its future." This is familiar language he uses when dealing with Republicans--and they rightly hear it that way. Obama took a swipe at the usual GOP suspects. Conjuring House Republicans--perhaps his most obvious target--he said, "We cannot mistake absolutism for principle, or substitute spectacle for politics, or treat name-calling as reasoned debate." On the issue of climate change, first-term President Obama might have called on lawmakers to reason together. Not this time. He framed the issue--which faltered in his first term in part because of Democratic opposition--by essentially calling his opponents flat-earthers: "Some may still deny the overwhelming judgment of science, but none can avoid the devastating impact of raging fires and crippling drought and more powerful storms," he said. And there was this code, straight from the bitterest of the campaign fights. "They do not make us a nation of takers," said the president referring to the entitlement programs of Medicare, Medicaid, and Social Security. "They free us to take the risks that make this country great." It was Paul Ryan, whose talk about "takers who feed off the government and don't pay taxes became an issue during the presidential campaign. Ryan was also the author of the premium support plan for Medicare that the president campaigned against. Afterward, during his lunch with congressional leaders, the president sounded a note of humility, saying, ""The longer you are [in the office of the presidency], the more humble you become." But there was none of this personal humility in his remarks on the Mall. If the president was in a mood to reach out to Republicans, he had no interest in making it part of the day's big event. If the president's message wasn't aimed at making common cause with Republicans, he was reaching out to the country. He hinted at a new kind of citizen activism--not votes but voices. "You and I, as citizens, have the obligation to shape the debates of our time, not only with the votes we cast, but with the voices we lift." This was a speech for "we the people"--a phrase he returned to repeatedly--not "we the lawmakers. This partisan edge is in keeping with the new freedom the president is feeling. He had coffee with Republican leaders before the inauguration and talked about collective action and unity, but he doesn't seem to be in a schmoozing mood. According to various White House aides--and the president himself--striving for comity just isn't going to do him much good when it comes to getting things done. It's not going to change minds in the House Republican caucus. Given that, the president has a low opinion of how much he can accomplish by making deals with John Boehner. As one White House adviser put it, speaking of the House speaker, "He's a nice guy, but he can't lead anyone to a deal." Thus, his speech was a preview of coming attractions. Expect the president to use his State of the Union, other big speeches, and campaign organization to create outside pressure that will inspire Republicans to act. After Monday's speech was over, the president sent a note to members of his political committee, now called Organizing for Action, thanking them and asking for their support in the months to come: "Now it's time to finish what we started--let's get going." The president's second inaugural is what passes for unity these days; tomorrow the battles begin again. John Dickerson is the co-host of "CBS This Morning." Prior to that, he was CBS News' chief Washington correspondent and anchor of "Face The Nation." Dickerson is also a contributor to Slate's "Political Gabfest", a contributing editor to The Atlantic, and the author of "On Her Trail" and "Whistlestop: My Favorite Stories from Presidential Campaign History."